Service Users at Bield’s care services across Scotland are being encouraged to follow their dreams thanks to a heart-warming Wishing Tree initiative. 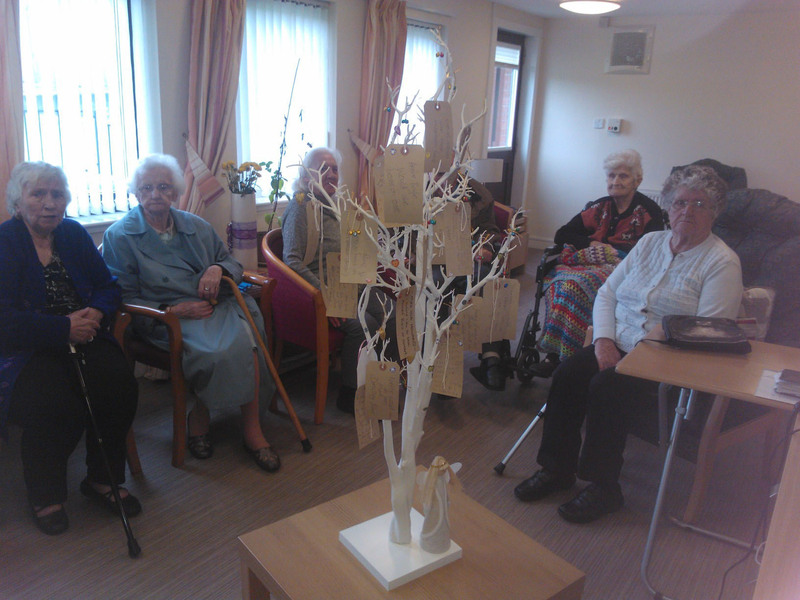 Service Users are encouraged to write down their desired wish and hang it on the Wishing Tree. Staff at the care service will then endeavour to make their wish come true – where possible. One previous wish that came true for Glasgow Flexicare service user, Chrissie Miller, saw her fulfil a lifelong dream for her 100th Birthday, when staff arranged with Virgin Media for her to travel in a hot air balloon. While 83 year old Helen Miller, also a Service User of the Flexicare Service in Glasgow, was reunited with her sister after years apart thanks to the project. Bernadette Farrell, Manager at Glasgow Flexicare, said: “The Wishing Tree project has been running for two years and has seen a wide variety of wishes, many of which we have managed to make a reality thanks to our devoted and hardworking staff team. “We have managed to make some more extravagant wishes come true but there are also many service users that just ask for days out at football matches or events, which are much easier to organise. Scotland’s leading care and housing provider, Bield, operate a ‘Free to Be’ policy which allows older people to live the lives that they want while being offered support when needed – and the Wishing Tree initiative is a prime example of this. Similar initiatives have become popular during the festive period with some children’s charities making kids Christmas wishes come true. However, Bield run the initiative all year round encouraging residents to hang their wishes on the tree whenever they like. Aileen Morton, Marketing Officer at Bield said: “The Wishing Tree programme is a great opportunity to showcase what Bield can offer its service users. “The Wishing Tree programme has helped service users across Scotland experience a range of social excursions, from a countryside visit which they have been longing for to trips to the cinema, concerts and museums – but we do our best to ensure we can help whenever possible. Would you like your stories to make the headlines?